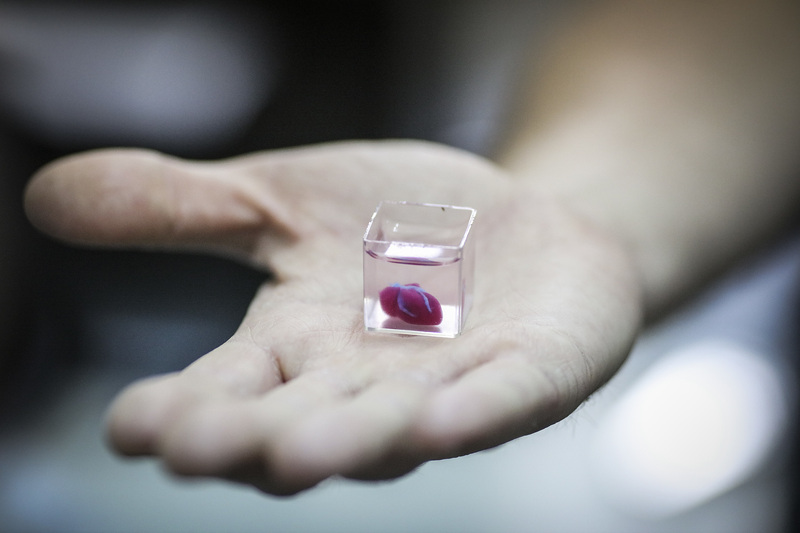 Israeli researchers have successfully created a heart made from human tissue using a 3D printer. The groundbreaking feat of engineering from the team at Tel Aviv University has surpassed previous prints of human tissue, which did not include blood vessels. It’s hoped the technological development could be a major step in the battle against heart disease. This is the first time anyone anywhere has successfully engineered and printed an entire heart replete with cells, blood vessels, ventricles and chambers. This heart is made from human cells and patient-specific biological materials. In our process, these materials serve as the bio-inks, substances made of sugars and proteins that can be used for 3D printing of complex tissue models. The process, as you’d expect, is pretty complicated. For the research, a biopsy of fatty tissue was taken from patients, according to a release. The cellular and a-cellular materials of the tissue were then separated. The next phase of research will see scientists attempt to make printed hearts behave like a human heart. Once this has been done successfully, attention will turn to providing working transplants first in animals, and then human patients. 10 years, there will be organ printers in the finest hospitals around the world, and these procedures will be conducted routinely.